As experimental as a cocktail bar and just as social, the Blue Bottle Cold Bar is a place to unwind and refresh with friends and co-workers. This space aspires to more be than a spot to drown your sorrows. When you savor a Suzuki Refresher (you can find the recipe for this sparkling cold brew coffee below) or share a Flight of Iced (shots of New Orleans, Oji, and Single-Origin coffees) with friends, you're not just refueling—you're enjoying an experience. Now featured at two of our cafes—South Park in San Francisco and Bradbury in Downtown Los Angeles—we think of Cold Bar as the invigorating complement to each cafe’s overall tranquility. Inspired by our founder James Freeman’s love of mixing spirits, we crowdsourced five recipes from our international baristas for the menu. 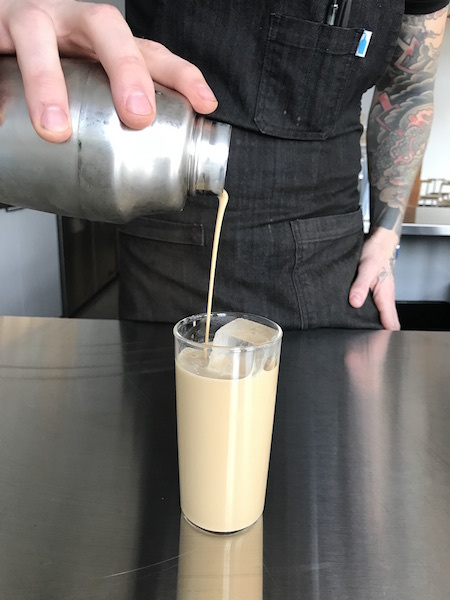 Their ingenious formulae run the gamut, from reimagined classics like the Oji Old Fashioned (Oji coffee, jasmine simple syrup, and a twist of orange peel) to fresh takes on our favorite flavors, like the decadent Shakerato (shaken espresso and cream). Made with Q Tonic water and the freshest mixers, we hope these cocktails are fascinating alternatives to the drinks you already enjoy, and that everyone who stops in—for a mid-morning escape or a celebratory happy hour—finds a zero-proof indulgence that's as delightful as it is restorative. Pour water into your favorite glass. Add coffee, then stir in simple syrup. Garnish with lime, have a seat somewhere comfortable, and enjoy. In a 2-liter container, add 4 grams of spearmint, 28 grams of coarsely ground Three Africas, and 350 ml of cold water. Steep in refrigerator for 8 hours, then strain and serve. Steep 5 grams of jasmine tea with 100 grams of boiling water in a pitcher or carafe for 3 minutes. Strain and add 25 grams of organic cane sugar. Let sit until dissolved. Once it's cooled to room temperature, it's ready for your Suzuki Refresher.